While diamonds have become iconic in the world of jewelry, there is another gemstone worthy of being mentioned in the same vein. The white sapphire not only looks as gorgeous as the diamond, but it also has similar structural properties that make it one of the best diamond alternatives available on the market. 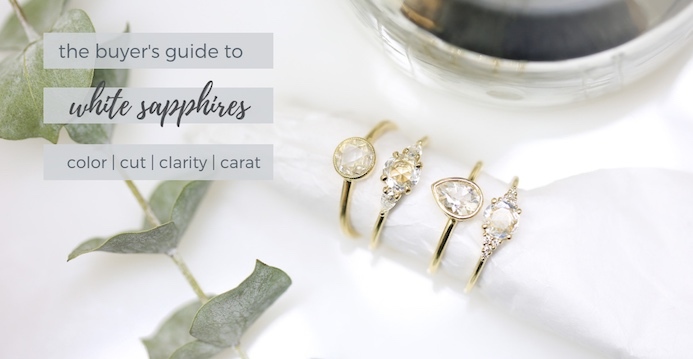 With this guide, you’ll be able to understand what makes white sapphires unique, how they are created, and what to keep in mind before you purchase one yourself. Sapphires are from the corundum family of minerals, which also includes the ruby. Colored sapphire and ruby gemstones are distinguished by unique impurities that create red or blue hues. Specifically for white sapphires, corundum sapphire gemstones are usually lab treated to achieve their colorless appearance. Corundum is a tough mineral – in fact, it is second only to the diamond in hardness. Because it offers a hardness and sparkle akin to the diamond but at a lower price point, white sapphires have become a popular substitute for diamonds in jewelry. Natural sapphires are sapphires found underground. They are not synthetically produced in a laboratory and thus not chemically changed in any way. Primarily differentiated by the cutting of the gemstone, the composition of natural and untreated sapphires is as close to the raw material as possible. In contrast, synthesized sapphires are grown and treated in labs that replicate natural sapphire producing conditions. While there are a few different approaches to synthesizing sapphires, the process typically involves applying high pressure and heat to corundum. The resulting gemstone is indistinguishable from a natural sapphire. If white sapphires are so similar to diamonds, then you may be wondering: what’s the difference between the two? Diamond remains the most brilliant gemstone, but white sapphires can look equally stunning. Like many other gemstones, the brilliance of the white sapphire is largely dependent on how it is cut. Many sapphires hold different lusters; some may even appear cloudy or milky. Inspected up close, the diamond will always win in terms of fire and brilliance, but to an untrained eye, the two are quite similar in appearance. While diamond cuts are graded by the Gemological Institute of America (GIA), sapphires have no grading scale equivalent. However, the GIA does publish sapphire reports, with the main focus being on weight, measurements, shape, cutting style, transparency, color, and whether or not the sapphire has been treated. Sapphires are second only to diamonds in terms of hardness. On the MOHS scale of hardness, diamonds achieve a perfect ten, while corundums are rated at a nine. Sapphires are durable and able to withstand regular wear but expect it to be slightly less scratch resistant than a diamond. Without a doubt, the single greatest advantage a white sapphire has over a diamond is its price. When comparing a 1.50 ct diamond with a 1.50 ct sapphire, the diamond will cost close to $6,500-15,000, whereas the sapphire will likely be sold around $1,200-$1,500. Diamonds with more carats may be even more expensive. Overall, white sapphire will always be more affordable. When selecting the best white sapphire, many of the same considerations in buying a diamond still apply. The most important factors to consider when choosing a white sapphire are color, cut, clarity, and carat, or as we call them, the 4 C’s of Sapphires. Color is one of the biggest factors in a sapphire’s value. While there are many different tones and colors available, when specifically choosing white sapphires, it’s best to go for something colorless or near colorless. Another important factor to consider while choosing a white sapphire is its cut – often, sapphire cuts affect other qualities of the gem, such as color and sparkle. Sapphires can be cut in shapes similar to diamonds, such as ovals, cushions, and even rounds. It’s highly recommended that you inspect the cut in person to judge whether it’s too deep or shallow. Love & Promise Jewelers only carries sapphires with good to excellent cuts – the top 40% of cuts in the sapphire market. Slight imperfections are unavoidable in sapphires as minerals become encased during the crystallization process. Natural sapphires may even include feathers, cavities, and fingerprints. However, as a general rule of thumb, the fewer the imperfections, the more valuable the sapphire. Similar to diamonds, the higher the carat weight, the more valuable the gemstone. One carat is equivalent to 0.20 grams. It is worth noting that sapphires are much denser than diamonds, so when the two gemstones with similar carat weights are compared, the diamond will appear much larger than the sapphire. White sapphires hold the unique honor of being one of the few gemstones with comparative quality to a diamond. If you are one of the many buyers concerned about conflict diamonds or expensive gemstones, a white sapphire can achieve the same level of beauty of a diamond but without the guilt and cost. Check out some of Love & Promise Jewelers’ own jewelry with white sapphire. For an idea of how beautiful a white sapphire can be on a ring, we recommend the Rosados Box Romani 7x5mm 14kt Rose Gold White Sapphire and Diamonds Cushion Halo Engagement Ring. Interested in a different cut? The Rosados Box Kitana 5mm 14kt White Gold Round White Sapphire and Diamonds Cushion Halo Engagement Ring offers a round cut of a completely natural white sapphire. For other beautifully crafted engagement rings featuring white sapphires, colored sapphires, and other captivating gemstones, visit our collection today. « What is a Cabochon Cut?